This last week I received a call from a person who had honeybees in the back of his RV. I guess the bees just wanted some rest and relaxation. However, the RV owner did not want the bees! So, he called me and I went out to take a look. The owner informed me that he had let his RV sit for over two years. He was just now getting ready to sell it. 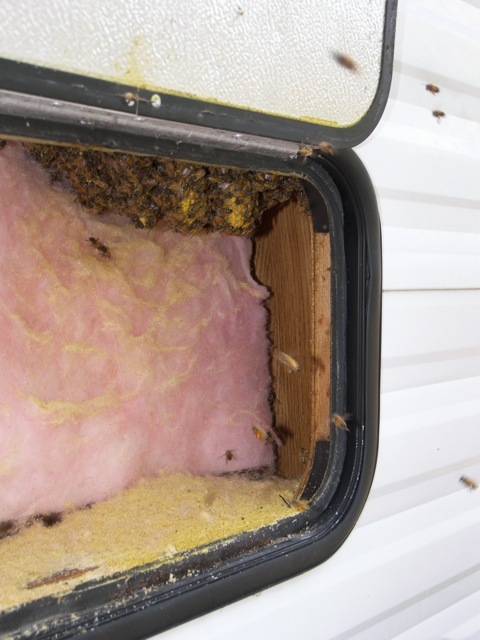 The owner had not noticed anything out of the ordinary when he was inside the RV, but when he went to the back to check on something…he was astonished to see a lot of bees flying in and out through a keyhole in a cubbyhole door. So, he gave me a call. When I got there, I went around back of the RV and opened the door to the cubbyhole. (I put on my bee suit first!) Sure enough, they had built a nest right inside the cupboard. Here is another great picture from Wikipedia. This cute honeybee is drinking some water. By the way, it can be hot this time of year, so be sure to have some water available for your honeybees. Just fill a pie pan with water and place a couple of rocks in it. Make sure the rocks rise above the water a bit to give the bees something to stand on. 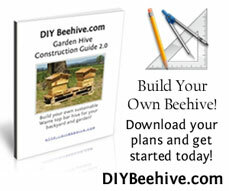 The honeybees will take the water and put it into their hive. As the bees fan their hive entrance, the water evaporates and helps to cool the beehive. Very smart little creatures!